Police say a man at a Hampton, New Hampshire, motel fired at officers before taking his own life during a burglary investigation Thursday night. Seabrook Police say they were with Hampton Police and responded around 8:30 p.m. to the Mari-Anne Motel on Ocean Boulevard for a follow-up crime investigation in Seabrook. A Special Weapons and Tactics unit also came to the scene. "I thought it was pretty wild to see the SWAT team there walking down the road with machine guns," said Hampton resident Dave Georgeoplous. 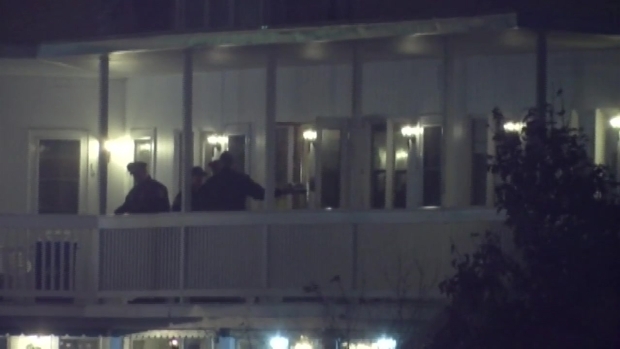 When officers arrived, a group of people exited a hotel room and spoke with officers. Officers entered the room afterwards and learned Brayton Burnham 38, was still inside. Police say a man at a Hampton, New Hampshire, motel fired gunshots at officers before taking his own life Thursday night. Burnham, who was in the bathroom area, pointed a gun in an officer's direction and fired one round. Officers retreated from the room and the motel was evacuated. "They told us to get the hell out, go anywhere, get out, get out, get out," said Hampton resident Doug Storen. "The subject inside is a 38-year-old man," Hampton Police Chief David Hobbs said. "He was found deceased. We believe that to be a suicide. There were no officers injured at the scene." People who live along Hampton, New Hampshire's Ocean Boulevard shaken and stunned Friday morning after a long night. "It was scary seeing the SWAT team over there," Hampton resident Christine Callan said. Residents say this type of police activity is unusual in Hampton. No officers fired their weapons or were injured during the incident.